This past Sunday I visited my favorite spice shop, The Spice House, and picked up a new seasoning to try. 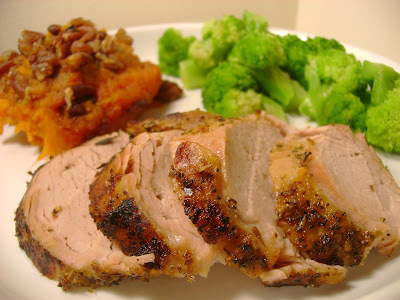 Their "Gateway to the North Maple Sugar Seasoning" was perfect with pork with hints a sweet and savory flavor. To prepare my pork tenderloin, I generously coated them with this seasoning... and roasted them on top of a bed of chopped apples, onions, a few garlic cloves and added a couple bay leaves and springs of thyme. After baking covered in a 350 degree oven for an hour, remove the pork from the apple/onion mixture and pace on a separate baking sheet. With a roasting pan of apples, onions, garlic, bay leaves and thyme left to play with, I thought a savory spin on the traditional applesauce would serve as a nice accompaniment with the pork. With this in mind, I removed the bay leaves and thyme from the pan and used a potato masher to get a finer texture on the apples, onions & garlic. What's wonderful about this mixture is that it doesn't need to be seasoned since the juices and maple sugar seasoning that coated the pork have filtered down into them. Once you've mashed it to your preferred texture for applesauce, you're set! 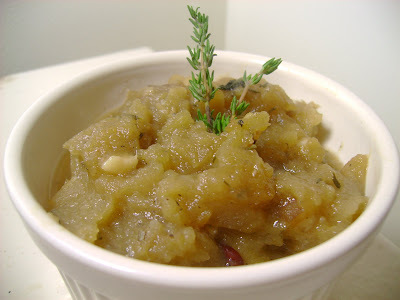 Place the savory applesauce in a serving dish or individual ramekin and garnish with a fresh thyme stem. 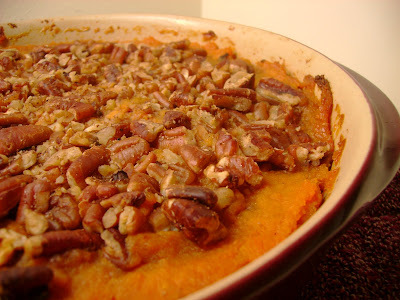 We love sweet potatoes at our house, even more than the russet, white or Yukon gold variety. 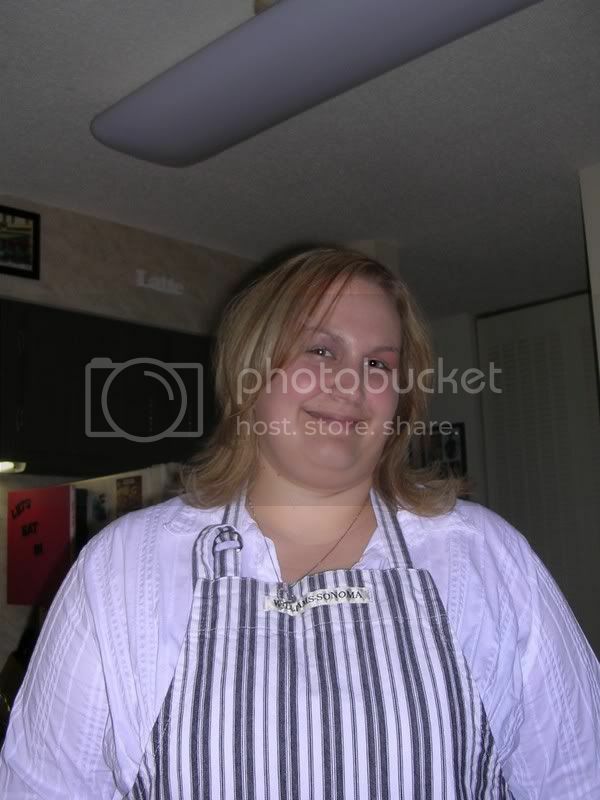 While we're on a fall flavor kick, I roasted some sweet potatoes and scooped out the soft flesh into a casserole dish. To add some additional sweetness, I stirred in about 1/4 cup of real maple syrup and salt to taste. 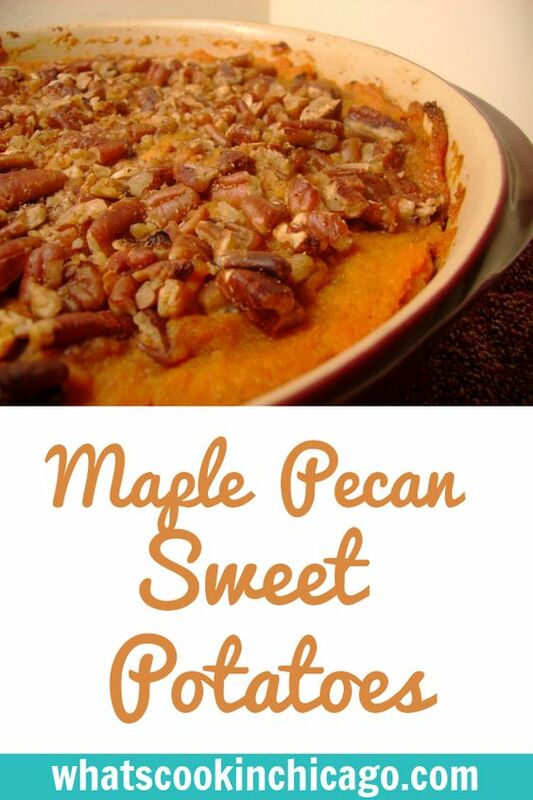 Top it with chopped pecans and bake in a 350 degree oven for 20-30 minutes. To round out our meal, I added some steamed broccoli for color and to add to our daily veggies for the day. Wow this looks awesome! 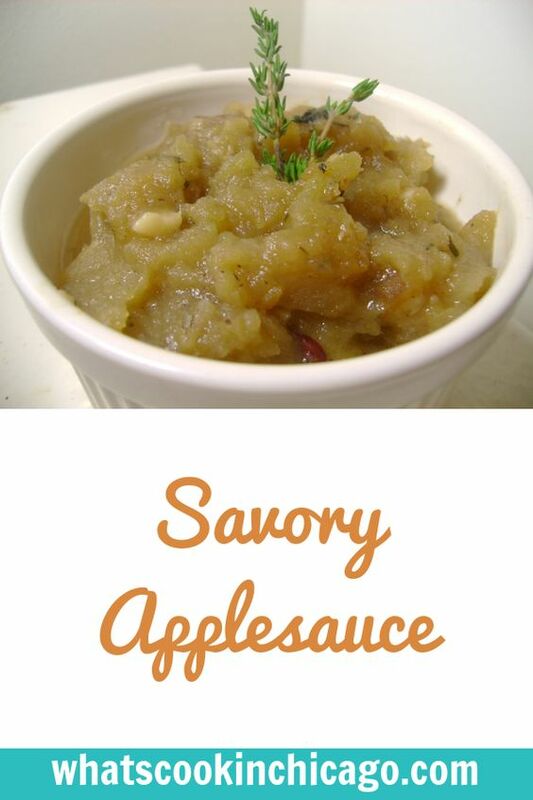 I just made applesauce but savory applesauce sounds wonderful. Wow! This looks so much better than what I ate...I must try the sweet potato dish! You just made me hungry all over again! All of this looks so delicious!! That looks like the perfect fall dinner! 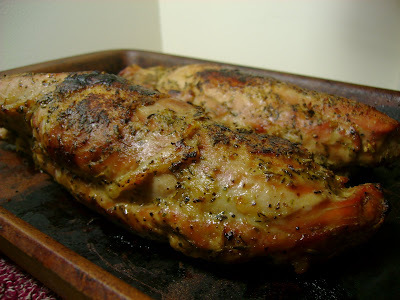 That pork looks so wonderfully juicy! I'll have to try it soon :) Thanks for the wonderful ideas! This is absolutely the perfect fall meal. I'm starring it so I can give that chicken a try--it sounds delicious.